My favorite seat on an airplane has always been the window seat. I love being able to look out the window and see what we're flying over or through. Have you ever flown 30,000 feet above a thunderstorm at night? How about over fireworks? Or a pod of whales swimming in the ocean? Those are some amazing sights! On our family vacation this year I flew home by myself so I could go back to work while my wife and daughters stayed with friends. I was already missing them when I boarded the first of 3 flights that would get me home. As I sat down next to the window I realized it had been a long time since I've had the window seat. 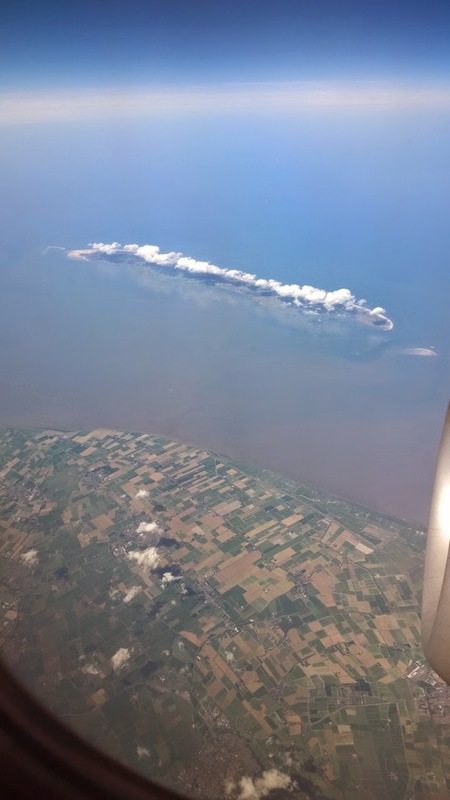 I saw a few cool things that I'd never seen before like a power generating windmill farm in the middle of the sea and clouds that were perfectly formed above an island while everywhere else was clear. When each of our girls were little, we've had good success when we bring her car seat on board the airplane. She gets to sit in a seat she's comfortable and familiar with and we can be sure she's securely buckled in. We've even done this when she's under 2 and not required to have her own seat. Trust me. It's way better than trying to hold her on your lap for several hours -- especially when she's 23 months old! More than once I've carried a sleeping girl off the plane while she's still strapped into her seat. I believe it's a safety regulation that dictates a car seat must always be placed near the window. So, now that I'm a dad I don't ever get to sit in the window seat. And you know what? I'm more than OK with that! Even before we had kids, my wife preferred the aisle seat, which meant I was in the middle seat to be next to her. The joy of having a family and traveling together far exceeds whatever pleasure I may have received from watching the clouds go by. I've often said that I like who I am as a husband and father much more than I liked myself as a bachelor. I know my life has immeasurably more meaning now that I have a beautiful wife and two beautiful daughters that I'm responsible for. In addition to responsibleness, Frankl describes love and sacrifice as other ways to find meaning. I love my family more than words can say and I would sacrifice anything to make their lives better. Even if that means giving up the window seat.